Aging happens to everyone and at some point that rosy glow and healthy, tight skin, will begin to change. And while aging is inevitable, HOW we age isn’t. We don’t have control over our genetics, but we do have control over our sun habits. You’ve heard it a million times. The sun is not your skin’s friend. Unfortunately, this has little impact when skin barring bikinis and the desire for a golden glow is the priority of the moment. We’re not saying not to enjoy the summer, but to take some preventative measures. Along with the risk of skin cancer, UVA rays prematurely age the skin and create damage now that will appear on the skin later. 4. Suntan beds contribute to skin cancer. Don’t do it. Being in the beauty business, our staff has the unique opportunity to try multiple sunscreens and evaluate them on their ability to block UVB (burning rays) and UVA (aging rays), effectively and safely. Equally important is the texture and wearability factor in real-life conditions; alone, under makeup, while on a tropical vacation. First up—we only carry physician grade products—a designation reserved for medical doctors to ensure that the products work while respecting the physiology of the dermis. The sunscreens below are the sunscreens our doctors and staff use year-round. the perfect makeup base for a flawless look with or without makeup. The formula comes in clear or a tinted version to add a hint of colour for a healthy looking skin with or without makeup, and provides antioxidant protection to keep skin young. Good to know: Elta MD sunscreens are composed of zinc oxide to create a physical barrier that is not absorbed by the skin. 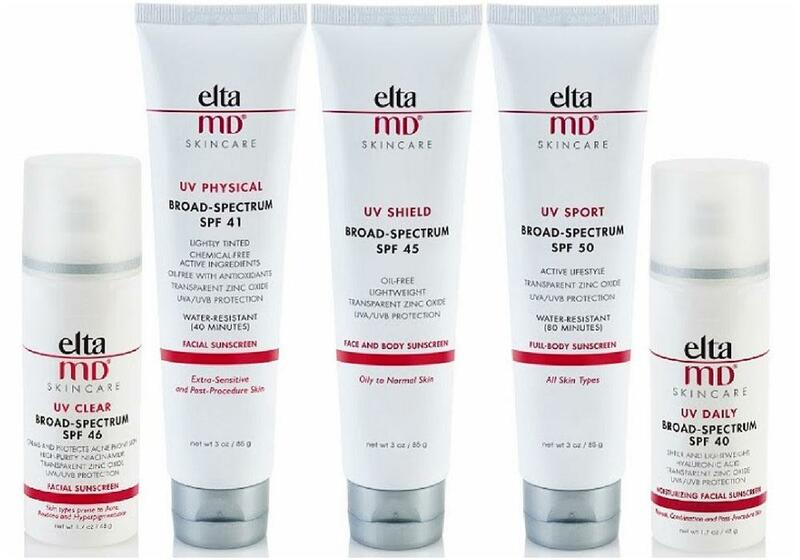 Elta MD will not cause outbreaks or irritation and comes in a variety of formulas suitable for all skin types. This is our top choice (and the choice of dermatologist’s world-wide) for beach days or prolonged sun exposure. The formulas are fragrance-free, oil-free, paraben-free, sensitivity-free and noncomedogenic. Available for the face in SPF 30-46. ZO is the brainchild of renowned dermatologist Zein Obaji, MD. One of our favourite sunscreens from the line is the ZO Sunscreen + Primer SPF 30. This is our choice for daily wear when we are out and about—but want to prevent aging while looking fab. This sunscreen smoothes the look of fine lines and visible pores for a flawless, matte complexion. Beautiful alone or under makeup—the science behind this baby is impressive. A subtle tint and silky matte finish are a bonus. Good to know: This non-greasy, quick drying sunscreen is Oxybenzone free and is engineered with a time-release complex to shield the skin from UVA, UVB and IR-A rays, as well as HEV light. It is composed of titanium dioxide (a physical block), plus melanin and vitamin E. Perfect for year-round use for the patient who wants the best in anti-aging protection. Take care of your skin now so you continue to look your best in the decades to come! (604) 942-8849 to check for availability.